Today we attended two quite different services, with almost opposite fruitfulness to that we anticipated. The first, a Pentecostal (churches are classified as either Baptist or Pentecostal) church run by a delightful man who has been in the MDiv class all week. He has a congregation of 30-40 young people, average age 20 years. The meeting was split into 30 mins worship followed by notices then preaching. Anyone walking into the worship blindfolded could have been forgiven for thinking they were in Redding, California, or any other Bethel church anywhere in the world. We were given 30-40 minutes to preach and after Peter had introduced himself I brought the word God had given me. It was difficult to tell how it was received — two came forward for ministry and I was certain there were more who should have done. Nevertheless we left rejoicing and knowing we had done what we were sent for. After a short break, into which we managed to fit a small lunch (potato curry, chapattis and vegetable soup), we went off to CCF, a fellowship of folk who didn’t belong to a particular church (though I didn’t quite understand why not. Nor did I discover what CCF stood for). They met next to a traditional church building and were pastored by a man who also looked after the main congregation there. The service began in worship, led by a group of singers/dancers from the Clark Theological College (CTC) we had visited a couple of days earlier. They were full of life and as they led us the room began to fill up. 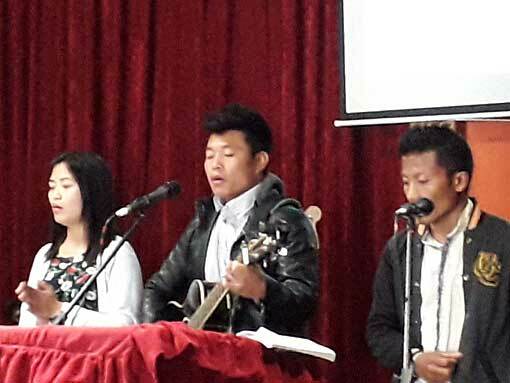 This was followed by a testimony by a young man, also from CTC, who had been saved out of alcoholism and drug abuse, and that was followed by an accomplished song written and performed by yet another CTC student. It was difficult to discern where the congregation were at, a right mixture is what it appeared to be! Clearly non-Pentecostal I was nevertheless led to preach on the fullness of life in him, the power and freedom of the Spirit and the implications of seeking a ‘spiritual’ life. In The Way of the Spirit terms of course we know what we mean by prophetic, revival or spiritual life, both terms easily misunderstood especially in a church context where churches are either Baptist or Pentecostal – I didn’t have the time though to explain all that. God gave me the words to use, the time flowed easily, and somehow the prodigal son, Jonah, Paul and the disciple’s storms all managed to come together to lead to a cohesive point! What happened next was pretty remarkable given I couldn’t tell how it was all being received. After inviting people to come forward for ministry, in recognition of a lack in their spiritual lives, wanting God to move them on, fill them afresh, and make them – as Paul says – spiritual men and women, I stood and not a soul moved. I know sometimes I have to stand and wait, though this time it felt like about half an hour. Eventually one woman stood up in the middle of her row and made her way to the front. The second person up was the singer/songwriter, and the third, one of the team who was singing and dancing at the start of the service. About nine more followed, including a married couple cleared moved by what God was doing. In fact most who made the journey forward were visibly seen to be meeting with God in one way or another as we ministered to them. The married couple, particularly, were beaming, glowing, with God. Later in the day we had another curry from Southern India, again cooked by Sir Sam (anyone without any other title is addressed by their first name prefaced by ‘sir’) and a little after that we greeted the party returning from Bangalore, who had caught the same flight as the party arriving from Bathinda, Punjab to join us for the second week.